After the dreaded conversion of my favorite Korean market to a Panaderia, it has come to this. I'm sure most of y'all are familiar with etsy by now. It is an online marketplace where you can buy all sorts of handmade items-- from fabrics to jewelry to artwork... it is all there. But did you know that there is a FOOD equivalent to Etsy?! 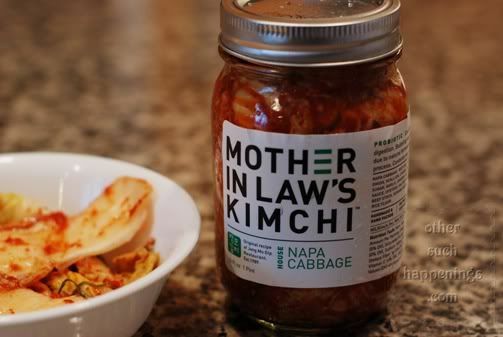 I bought this yummy Mother in Law's Kimchi from Foodzie.com. Although the jars are small for the price that you would pay in a traditional market, it is worth it! It's at just the right stage of fermentation where you can it eat with rice or cook it in a stew. Since David and the boys won't go near the stuff, this should last me for a while. Besides, it would take me 1.5 hours roundtrip to drive to a store. If you figure in gas, traffic and time... this online kimchi will work out great for me, thankyouverymuch. I am blown away by all the specialty items like local honeys and jams and even gluten free goods. The $7 flat rate shipping is a great deal for those purchasing heavier items. Let me know if y'all try anything from Foodzie.com. I promise I'm not getting paid to promote them! I just get worked up when it comes to food, especially food that someone thinks is so good that they should try to sell it on their own. It would be nice to see this site grow. I know people like my mexican casserole but I don't think there's a market for that. Have any of y'all ever thought of selling food online? What would you sell? Boy, I kinda sound like an infomercial. I was just excited to get kimchi delivered right to my door. Pretty cool for living in the boonies. That kimchi looks good. :) I have to share with Emily when I get some. I think I'll go check out the site and see what other goodies they might have. :) Love you!!! THe first time I had Kimchi, I was at a Songran Festival with my girlfriend and her family. That's so neat, an ETSY food store! I would love to get Japanese Sea Weed too! Well Melissa, it's not technically or even close to being real Mexican food. But it has meat, beans, cheese and Ro-tel! All the basic food groups, right? my mom loves the stuff (though she is not Korean), and although I cannot recall ever having touched it, it seems like it's possible I'd like it... what is it? vinegar? cabbage? onions? why is it red? Now $7 would be amazing if they sent stuff to Peru! I would NEVER sell food online... I don't think. But then again, you probably would never find me shopping for food online either. Though, perhaps I could get into it if I was actually within reach of normal shipping charges and out of reach of nice food stores. I feel like this is a fragmented and strange comment I'm leaving... I think I'm tired. Ok, so now I want to know what Kimchi is...? I had no idea there was an Etsy-style store for good. How cool! What a neat site! I wondered if there was something like that out there. I have thought about selling food things. If I could make something foodie and sell it, I'd want to make those cute cake pops like on bakerella.com Or cookie bouquets. I did not know that there was a food equivalent to etsy. But now I do, and I'm really afraid that I am about to lose a lot of time drooling over my laptop. Oh, I love me some Kimchi. I crave it, especially when I have a cold (open those pores right up:) ), but by the time I get to Mom's hers is usually "wangy." Can. not. stand. wangy. kimchi. Sometimes she will make me a big jar and I am in heaven the first few days (then it gets, yes, you guessed it, wangy). I may have to look into this food site. I made a button for my blog. Drop by and snag it. :-) Hope you have a wonderful day! I have a recipe if you want to make your own kimchi. Oh, and btw... next time you're in OR I'll take you to H mart and we'll stock you up on goodies! HA! I just saw where you commented on my size 6 post! You are funny! And thanks!